Known as “The Garden City”, as well as the “City of Newly Weds and Nearly Deads” due to it’s parks, gardens, large number of young couples and seniors, Victoria, named after Queen Victoria, has been described as a ‘piece of England’. 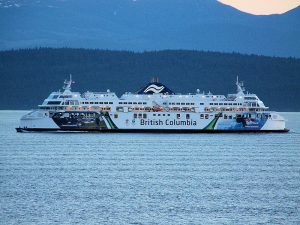 It is equidistant (60 miles) from the city of Vancouver on the British Columbia mainland and from Seattle in the state of Washington, with regular ferry and air service to and from each city. Victoria is one of the oldest cities in the Pacific Northwest and has a large number of historic buildings. 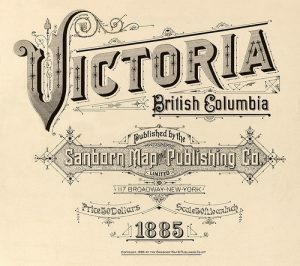 Founded in 1843 as a trading post for the Hudson’s Bay Company and incorporated as a city in 1862, Victoria was designated the capital city when Vancouver Island joined with British Columbia to become a united colony in 1866. British Columbia joined the Canadian Confederation in 1871 and Victoria remains the capital today. Enjoying a more temperate climate than most cities in Canada, it counts among the top 20 cities in the world for quality of life, according to Numbeo, a global database that measures cost of living, crime rates, health care and other statistics. Compared to the larger mainland city of Vancouver, Victoria is quieter, charming, skyscraper-free and slower paced. The downtown area is distinguished by it’s Victorian historic architecture and beautiful Inner Harbour. Highlights include Parliament with it’s neo baroque buildings dating from 1897, attractive gardens and statues of George Vancouver, who first circumnavigated the island, and Queen Victoria. Vancouver is on the top of the large dome, while Queen Victoria faces the Inner Harbour from the terrace. The entire complex is beautifully and dramatically illuminated in the evening. The Fairmount Empress Hotel was built in 1908 and is a well loved landmark. 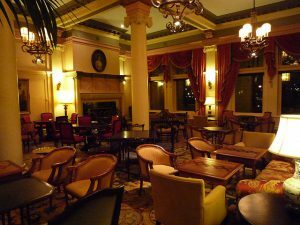 It’s large lobby and ornate salons where afternoon tea is still served in English style, take the visitor back in time. The hotel houses Miniature World, an attraction popular with both young and old, which showcases models of castles, dollhouses and most recently, King Arthur’s Camelot. Between Parliament and the Fairmont Empress lies one of the greatest museums in Canada, the Royal British Columbia Museum. Featuring exhibits relating to natural history, the First Nations people and European settlement, it contains a rain forest, an IMAX theater, a replica of the HMS Discovery, which brought Captain Vancouver to the island and replicas of colonial settlements and Old Town shops. Thunderbird Park, outside the museum has massive and colorful totem poles showcasing the ornate carving of the First Nations people. In the summer, there is a food truck festival located outside the museum. 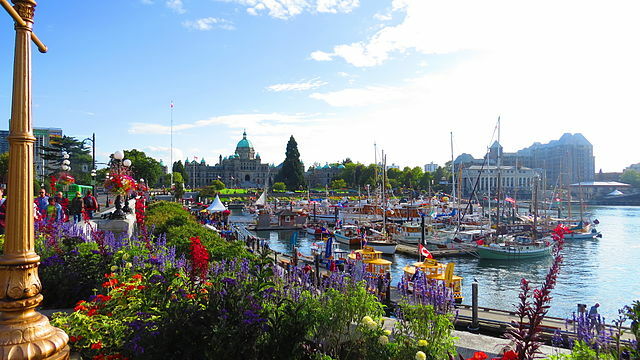 The Inner Harbour, lined with cafes, restaurants, shops and parks, is one of the world’s most attractive harbors. In the summer months the harbor comes alive with music, shows and festivals. Whale watching tours, water taxis and ferries to British Columbia and Washington State depart regularly from here. 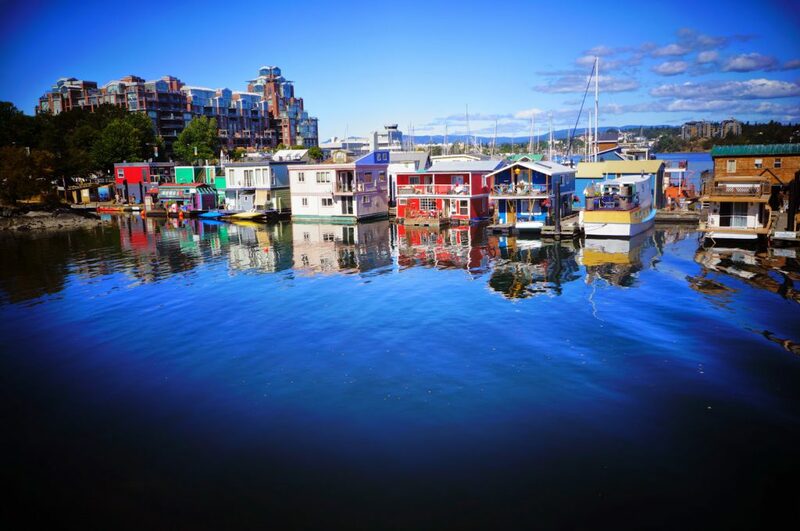 Around the corner you will find Fisherman’s Wharf with it’s colorful boats, floating homes and food kiosks. Buy fresh fish right of the boat or grab some lunch from one of the vendors and wander the docks taking in all the activity of a working harbor. A definite must see in Victoria are the Butchart Botanical Gardens. Established in 1904 by cement manufacturer Robert Pim Butchart, the gardens cover 55 acres with over one million plants. The sunken garden, planted in what was a limestone quarry, the Italian, Mediterranean and Japanese gardens will amaze you with the variety of colorful and exotic plants and blooms from around the world. In the summer, the gardens are illuminated by colorful lights at night and often feature live musical performances. 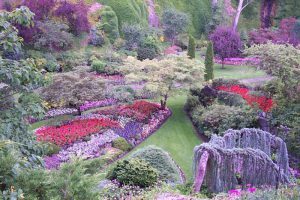 Over a million visitors each year make the Butchart Gardens, located at Brentwood Bay, about 13 miles from the city, one of Victoria’s top attractions and one of the most famous Botanical Gardens in the world. Near to the botanical gardens are the Victoria Butterfly Gardens. These indoor, computer controlled gardens house over 4,000 butterflies in a 12,000 square foot rain forest. Carnivorous plants, colorful exotic birds, koi fish and waterfalls make the butterfly gardens a perfect rainy day attraction. The Maritime Museum of British Columbia recently located to the Inner Harbour. Ship models, artifacts, maps, photographs and an art collection are on display. The prior location at Bastion Square had been quite famous for it’s haunted birdcage elevator, which was the oldest operating elevator of it’s type in North America. The building originally housed the provincial law courts and the ornate elevator was made and installed for a chief justice who died before it was ready. 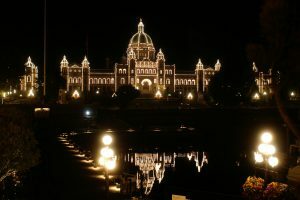 Victoria is said to be the most haunted city in British Columbia and nightly ghost walks are offered from May 1-October 31. 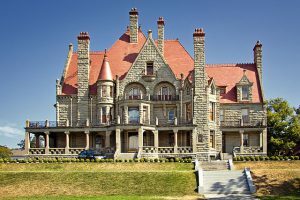 Craigdarroch Castle was built between 1887 and 1890 by Scottish coal tycoon Robert Dunmuir. This ornate Victorian mansion, like the birdcage elevator, was not completed until after Dunmuir’s death and is also said to be haunted. Self guided tours are offered daily which enable you to explore the 39 rooms of period furnishings, climb the many staircases and admire the stain glass windows, gargoyles and exotic woods of this 20,000 square foot castle. Also worth exploring is Victoria’s Chinatown, the second oldest in North America after San Francisco’s. Once the site of gambling and opium dens, Victoria’s Chinatown, though small, retains a presence with it’s ‘Gate of Harmonious Interest’, Fan Tan Alley and historic buildings and shops. Any trip to Vancouver Island should include a relaxing cruise through the Gulf Islands. Don’t miss Sidney by the Sea which is the gateway to the Gulf and only port of call in the Washington State Ferry system. Located 15 miles north of Victoria, Sidney’s many bookstores, coffee shops, quaint shops and scenic waterfront as well as it’s markets, festivals and parades, make it a popular destination.